Four years in the making, Pitbull has finally released his first Spanish-language album, his fifth studio album overall, to an awaiting fan-base. The Miami-based rapper's self-titled offering is dedicated to his late father whose image is featured on the album cover. 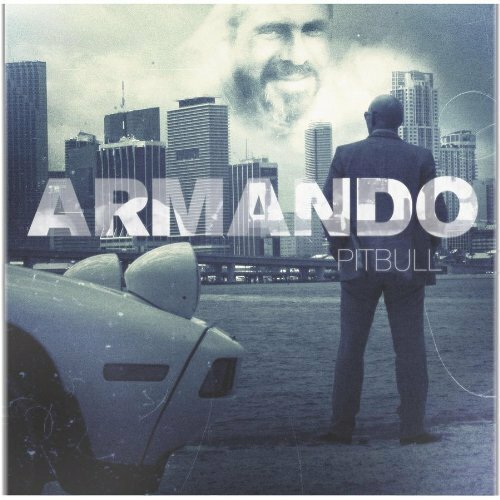 A mix of hip-hop, rap, dance, and reggaeton, Armando brings a diverse range of dance tracks to Pitbull's repertoire, many of which will make their way into club playlists (if they aren't there already). The Agents and Papayo open the album with a traditional Plena track to set the mood for Pitbull's spanish record. At 43 seconds, it is brief enough to be dismissed as just an introduction, but, honestly, it is one of the better recordings on the album. The track segues into one of the singles off the album, "Maldito Alcohol", pairing a beat as empty as the song's lyrics with weak rhymes and annoying percussion. Leaving this as the first full-length track on the album may have been a misstep when considering the final mix of the album. "Guantanamera" likely would have been better if Pitbull hadn't literally tried so hard to honor the classic song and modernize it's legacy. Musically, removing the words "Guantanamera" and "Guajira" from the track and replacing them with anything else would have made this more respectable. Another miscue on the album is seen in "Mujeres," the Spanglish-language version of the Beastie Boys' "Girls." Juvenile lyrics and tired topics take all the charm and whimsy out of the original record and cheapen it to less-than-novelty music. And it's position early in the record breaks the flow of dance music with the crossover oddity. The only (slightly) redeeming point of the track is hearing Pitbull say "el child support," which brings fits of laughter at it's absolute nonsense. Background vocals of "We don't die / We mutiply" reach out to the English-only listener to make sure the point gets across. Pitbull hits it big with "Bon Bon," three-and-a-half minutes of excellent energy and clearly a standout on the album. Sampling Yolanda Be Cool's "We No Speak Americano" (which itself samples Renato Carosone's "Tu Vuò Fa' L'Americano), the track has the presence to fill any floor with feet and available airspace with pumping fists. Sharp and flowing vocals are the charm of "Amarosa," featuring Papayo's smooth voice on Mc Marcinho's sampled dance anthem "Glamurosa." Of all the tracks, "Amarosa" showcases Pitbull's abilities ensuring that everyone is aware that he can indeed rap in Spanish (the only Spanglish on the track is Papayo's addition). "Tu Cuerpo" (English, "Your Body") is another surefire dance hit, featuring Jencarlos Canela for a hair over four minutes, the longest piece on Armando. The euro-dance beat and synth make this sound more like a Spanish E-Type than a Pitbull album, but the rapper lays down the rhymes with relative ease in between Jencarlos' fresh electropop choruses. "Vida 23" creeps onto the album as somewhat of an oddity; the recording is part of an advertisement campaign by Dr. Pepper who seem to be readily jumping onto the Hispanic bandwagon as of late. Their "Vida a la 23" (representing the 23 flavors in Dr. Pepper) campaign is the primary purpose of this track even existing, and it's pure marketing intent cramp the whole song. Enticing his audience to "have a real good time" and to "disfrutar la vida" (enjoy life) are thinly veiled attempts at normal dance subject matter used to reference the commercial aspect of the song. While likely a strategic part of the marketing campaign, why did anyone think that consumers would want to listen to what amounts to a three-minute advertisement on an album they've already paid for? The standout single from Armando, "Watagatapitusberry" is the blockbuster of this show. Mr. Worldwide employed a range of talents including Sensato Del Patio, Black Point, El Cata, and Lil Jon (yes, THAT Lil Jon) for a fun, while indecipherable and ridiculous take on the Black Point song. The song touches on the incomprehensible title name and the explanations for it (ranging from a drink recipe, to ridiculing an English speaker trying to speak Spanish, to Dominican slang of a ribald nature) that are running rampant on the internet. Whatever it means, Pitbull has knocked one out of the park with the body-moving track and lighthearted accompanying music video. Lil Jon yelling "Que" is the highlight of the track (if not the entire album), and if any track on this album will remain in the listener's mind, this is the one. The album closes on the almost forgettable "Preguntale." The track is written and performed well, competent rap over a solid (if not typical) gangsta rap violin beat, but lacks the standout quality of a "Bon Bon" or a "Watagatapitusberry." Grouped with "Mujeres" and "Vida 23," the flow of the album is disturbed making Armando more of a collection of tracks to be used on a mixtape singly, rather than a cohesive recording itself, and at only 38 minutes, anything more than one faux pas can really cripple the listening experience.